The tutorials are currently in PDF only and some still have to be updated to the new December 2016 version (2.015). As we are completing the migration of website and servers, we will start updating the PDF tutorials and creating new video tutorials. This page provides answers to Frequently Asked Questions (FAQ). If your question is not listed below, you can send us an e-mail. If you experience program errors, please include information on your operating system (including the service pack number) and your version of Excel. How much does MIX 2.0 cost? MIX 2.0 is available in two versions: Lite and Pro. MIX 2.0 Lite is free and can be used to learn about or teach meta-analysis with built-in datasets. The Pro version has all the features of MIX 2.0 Lite, but also enables users to create custom datasets and convert effect sizes. MIX 2.0 Pro costs 235 USD, with discounted prices for researchers at academic institutes, non-profit organizations, and students. Bulk discounts are applied automatically (5% on 5 or more licenses and 10% on 10 or more licenses). How do I buy MIX 2.0 Pro? Go to the ‘Get it Now’ page and click on a ‘Buy now!’ link in the license overview table or click on any of the relevant product links in the sidebar. Once you are on the product page, click on the ‘Add to cart’ button and in the sidebar you will see the item appear in the shopping cart summary. If you click ‘View Cart’ you will be taken to your cart. If you have a coupon, you can enter it here and click ‘Apply Coupon’. Then click on the ‘Proceed to Checkout’ button in the lower right-hand corner to proceed to the checkout page. If you have registered already, you will see your name and contact information in the relevant text fields. If this is your first purchase in the store, fill out your information and an account will be set up automatically. You will need the account to activate or deactivate licenses and make sure you receive update alerts. After you have filled out the information, click on ‘Proceed to PayPal’. If you do not have a PayPal account or do not want to pay with PayPal, don’t worry: you will be able to pay with a credit card as well (but the payment will be made to our PayPal account). Do I need a PayPal account to buy MIX 2.0 Pro? No, you can buy MIX 2.0 Pro without a PayPal account. Your payment will be made to our PayPal account (so handled by PayPal), but you can pay with a credit card if you prefer that. We do not accept checks or wire transfers, unless it is for large bulk purchases for institutions. How does it work to buy discounted licenses? The student license is available for Bachelor’s and Master’s degree students. The academic license is available to all teaching staff of academic institutes. When you purchase a discounted license (student or academic), you are required to upload a proof of affiliation. This can be a scanned copy or picture of your student ID, or a student status confirmation letter from university administrative office. Until we have reviewed and approved the uploaded file, the order of the license will be set to pending. Your payment will only be processed after approval. If your status is unclear upon review or you may have forgotten to upload the file, you will receive a reminder to upload the file. If you cannot provide the necessary information, your order may be canceled. Must a license be purchased by the actual user? No, a license may be purchased by someone other than the actual user (for instance, an employee of the IT Department of an academic institute). An exception is the student license, which must be purchased and applied for (upload of a scan of the student ID) by the student personally. A purchased license will registered to the account that was used or created during the purchase and this is where the license can be managed (e.g. where you can see the license code and its activation status). How long is a license for MIX 2.0 Pro valid? There is no time limit on the use of MIX 2.0 Pro, so a license will remain valid indefinitely. Are there any additional charges for updates? No, all updates are free. In principle, we do not issue any refunds for purchased licenses. If you would like to try out MIX 2.0 before buying a license, you can download the free Lite version that has many of the features contained in MIX 2.0 Pro. If MIX 2.0 Lite runs without issues, so will MIX 2.0 Pro. If you have any doubts about compatibility, contact us via the contact form. How do I activate MIX 2.0 Pro? Once you have downloaded and started the software, click on the ‘About’ button in the ‘Help’ ribbon group and then click ‘Activation and updates’. 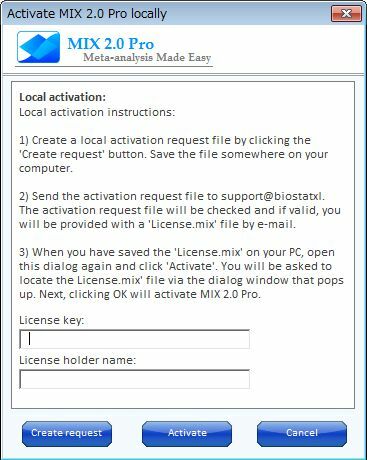 Follow the steps in the activation dialog (you will need to enter your license code). Please note that the software cannot be activated without an active internet connection. You can activate MIX 2.0 Pro on two computers. To use MIX 2.0 Pro on more than two computers simultaneously, you will have to purchase an additional license. As of version 2.015 (December 2016), MIX 2.0 is activated and deactivated via a new process and uses new license codes. If you purchased MIX 2.0 Pro before December 2016, you can use your old license code as a coupon to reduce a new license to $0.00 and transfer your license for free. I purchased MIX before December 2016 and updated recently. I seem unable to activate. What is wrong? As of version 2.015, MIX 2.0 Pro uses new license activation technology and a new license code system. The old license codes purchased before December 2015 are no longer valid and therefore the activation does not work. As an existing user, you can get a free license transfer. This is completely automated. Simply add a new license to your cart of the MIX 2.0 website (a license that corresponds to your old license, e.g. standard, academic, student, etc) and use your old license code as a coupon code for this purchase. This will reduce the price of the license to $0. Upon completion, you will be sent a new license code that can be used to activate the versions of MIX after December 2016. Please be aware that your license can only be used once as a coupon code and will be void after this single use. The coupon’s discount is for one license only. If you cannot provide a valid license code, we cannot provide you with a license transfer and you will have to purchase a new license. I get an error during activation. Why is my activation failing? The new activation module is quick and in line with industry standards, but integrating it into an Excel add-in has been challenging. Up to version 2.015, there is a bug that causes errors on installations inside Windows Operating systems with double byte languages (i.e Japanese, Chinese). If you encounter an error and are using a version of Windows in these languages, please create a local activation request. This can be done by clicking on ‘About’ in the ‘Help’ ribbon group and then clicking on ‘Activation and updates’. In the dialog that pops up, you will see a link at the bottom that says “Are you experiencing trouble with the activation?”. When you click it you will see a button that says “Local activation”. Clicking that will show a new dialog that will take you through the local activation process. Can I transfer a license activation from an old computer to a new one? No, but you can deactivate MIX 2.0 Pro on your old computer (this will open up a slot on the MIX activation server) and then activate MIX 2.0 Pro on your new computer. When should I deactivate MIX 2.0 Pro? You should deactivate MIX 2.0 Pro before reinstalling your operating system or replacing your computer. This will open up a slot on the MIX activation server for your new installation. To deactivate, click on ‘About’ in the ‘Help’ ribbon group within MIX and then click on ‘Activation and updates’. Follow the directions in the dialog to deactivate. If you have trouble deactivating via the internet, you can consider (as a last resort) to follow the local deactivation process. Which versions of Windows and Excel is MIX 2.0 compatible with? MIX 2.0 is compatible with all versions of Microsoft Windows after Windows 2000, and with Microsoft Excel 2007 or later (32-bit and 64-bit versions). Can MIX 2.0 be used on a Mac computer? MIX 2.0 is not compatible with Mac OS, but it can be used on a Mac computer that runs Windows and Excel with a program like Parallels or VMware. We have received feedback from users that they were able to run MIX 2.0 Pro on a MAC OS via Parallels and VMware, we cannot guarantee that MIX 2.0 will work flawlessly in that environment and cannot provide relevant support. Where can I find help on how to use MIX 2.0? MIX 2.0 comes equipped with built-in help in the form of a Tips & Tricks dialog and a Meta-Tutor. The Tips & Tricks feature provides hints on how to use MIX 2.0, while the interactive Meta-Tutor gives descriptions of each analysis output. In addition to the built-in help features, the website contains a number of sources to learn more about MIX 2.0. First of all, the Learning Center contains a range of online tutorials on how to use MIX 2.0. The tutorials can be in PDF or video tutorials that are also available on our YouTube channel. How many studies can be entered in a MIX 2.0 Pro dataset? You can include as many studies in a custom dataset as you can fit rows in an Excel sheet (minus one for the header). This amounts to 1,048,575 rows. How does MIX 2.0 Pro compare with other dedicated meta-analysis programs? In general, MIX 2.0 Pro can perform graphical and numerical analyses that go beyond those offered in most other dedicated meta-analysis programs. MIX 2.0 Pro is particularly versatile in terms of graphical capabilities, and the fact that it runs within Excel means that you can use all the Excel features to adjust, export, and share your results. However, MIX 2.0 Pro focuses on single-group or pairwise meta-analysis or meta-regression and does not perform formal network meta-analysis nor is it capable of diagnostic meta-analysis (unless diagnostic odds ratios are used as a generic measure). It uses a Frequentist statistical framework although a rudimentary Bayesian triplot feature is included. It is worth mentioning that in comparison to RevMan, the numerical and graphical features are more comprehensive, but it was not developed to manage references or reviews, like RevMan. The program CMA is also not as flexible and comprehensive in it’s graphical and numerical options, in particular when it comes to adjusting plots and tables. However, CMA provides more options for entering data in different formats and creates consistent measures for analysis internally, whereas MIX 2.0 Pro requires you to create a consistent set of effect measures prior to entering the data by means of the built-in Data Converter. This makes the process in MIX 2.0 more transparent, but also requires a bit more work. How should I cite MIX 2.0 Pro? Bax L: MIX 2.0 – Professional software for meta-analysis in Excel. Version 2.0.1.5. BiostatXL, 2016. https://www.meta-analysis-made-easy.com.